IMAGINE...So important a message that 150 Nations contributed to the Garden of Peace that surrounds the beautiful mosaic inscribed with one single word, IMAGINE, embodying the principle of world peace. 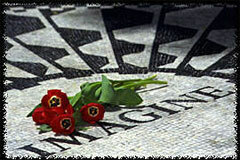 On the 25th Anniversary of the loss of John Lennon, we remember and reflect. "Imagine all the people living life in Peace... I hope someday you will join us and the world will live as one."